The benefits of essential oils have been everywhere lately, but if you’re a little overwhelmed or aren’t sure where to begin, here are some things to know and some good ways to get started. Very simply, essential oils are a highly concentrated version of the oils that occur naturally in plants. They are gathered through a process of distilling various parts of the plant with steam or water. This removes the oils from the plant and concentrates them. Essential oils have all of the same characteristics as the plant they came from – the same scent as well as the health benefits the plant provides. It’s difficult to evaluate the effectiveness between brands as no official grading system exists. Some companies will say that their oils are “therapeutic grade” but that is usually just a marketing term. As long as the oils are collected and distilled properly, they will provide you with the benefits of the plant source. You will also see some essential oils labelled as “pure.” Again, since there is no third party regulating these terms, it’s hard to tell what this means. It could meant that the product is a single oil and not a blend or mix of different ones. It could also mean there’s no additives or fillers. Because there is no real way to tell these things, the best way to know you’re getting a high quality product is to choose a well known brand with a good reputation. Make sure they have good customer feedback and are honest about their product. Generally, the more information they provide, the more you can trust them. There are actually a lot of ways to use essential oils. Each one is known for having a specific effect on your mind and body, so the first thing to do is decide which essential oil you want to use. We’ll get into some of the most popular ones later. But first, let’s talk about the various ways you can use essential oils. Please note, these are guidelines only. Everyone will respond differently. Because essential oils are fat soluble, they are quickly absorbed into the skin. Essential oils should never be directly applied to the skin. First, they should be mixed with a carrier oil or base oil, especially if you have sensitive skin or a history of a lot of seasonal allergies. Carrier or base oils are neutral oils that help the oil soak through the skin. There are a lot of different kinds and no one type is better than another. It really boils down to your preference of smell, texture, or any allergies you have. Some popular carrier oils are coconut oil, almond oil, or grapeseed oil. Once diluted, the oils can be applied to your wrists, feet, or behind you ears. There are several ways to make this method work. First, simply rub a few drops into your hands, onto a tissue, or even your pillowcase and breathe them in. Use one drop at first to make sure you don’t have a reaction to it. You can also use the essential oils are massage oil, as long as you mix it with a carrier oil first. Another thing to keep in mind, if you do choose to use an essential oil on fabric such as a pillowcase, beware that it might leave a stain. Another option is to use steam inhalation. Boil water, pour it into a bowl, and add a few drops of your essential oil to the water. Then, stand so your nose is about a foot from the bowl, cover your head with a towel to keep the steam in, and inhale. Stop if you notice any irritation or breathing difficulties. Another way to take advantage of steam is to drop some essential oil into warm bath water. Use Epsom salts as a base to help the oils dissolve. Lastly, a popular way to use essential oils in with a diffuser. An electronic diffuser will have a small reservoir where you place the essential oil and then gently send it out into the air. This is a great way for more than one person to share in the experience as the scent and benefits will fill the whole room. Cinnamon – Yes, the same cinnamon that’s used in baking also increases circulation, decreases inflammation, lifts mood, stimulates the immune system, and stimulates libido. Eucalyptus – With a strong, minty scent, eucalyptus is used in topical pain relievers and decongestant rubs to help clear up your sinuses. It’s also a great anti-microbial and stimulates the immune system. Frankincense – This is one of the oldest essential oils in the world and has a mellow, earthy smell. It has many uses. It’s a stress reliever and mood enhancer, plus it relieves itching and helps fade scars. Grapefruit – A citrus fruit that has a lot of benefits, grapefruit can help cleanse your body, awaken your immune system, curb sugar cravings, and even lose weight. Lavender – Distilled from the flower of the same name, lavender essential oil can helps you calm down and get more sleep. It also has antibacterial and antifungal properties and can help relieve sore muscles and joints. Lemon – Lemon is a widely used essential oil and has been for quite some time. It’s benefits include having antimicrobial properties, a weight loss aid, and it can help relieve nausea. It can lower anxiety while enhancing mental clarity. Lemongrass – Lemongrass works on digestive health as well as soothing muscles aches, drying oily skin, and relieving stress. Lime – Acne, colds, and varicose veins can all be helped with lime essential oil. Orange – To beat stress, aid your digestive system, treat the flu, or give you skin a healthy glow, try sweet orange essential oil. Patchouli – Patchouli can help with chapped. Dry skin, fatigue, dermatitis, and increase libido. Peppermint – This is another widely recognizable essential oil that has a long list of uses. It can help prevent and treat colds, relieve joint and muscle pain, and improve digestion. Pine – For help clearing up colds, coughing, and flu symptoms, try pine. Rosemary – Rosemary is helpful for arthritis, muscle aches, dry skin, gout, poor circulation, and even dandruff. Tea Tree – Tea tree oil has a fresh, herbal aroma and can help treat infections, bug bites, and it can help with dandruff. You can also use it as a deep cleanser for your skin. Now that we’ve covered the basics about essential oils and some of the most popular kinds, you might be wondering where you can get some essential oils of your own. 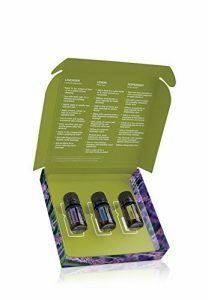 Here are a few great starter kits that provide a variety of essential oils to help get you started. 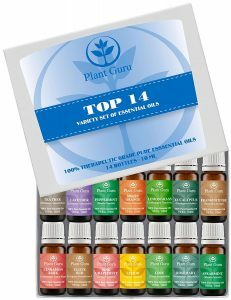 Plant Guru is a small, family run business that offers an essential oil set that includes fourteen different essential oils in 10 ml sized bottles. This is a trusted brand that practices strict quality control and never adds any chemicals, synthetic materials, or carrier oils to their products. They use quality ingredients and source from ethical producers and believe that everyone should get to experience the magical effects of essential oils. That’s why they focused on making a good product rather than marketing and can pass the savings onto you. This kit comes with the following scents: frankincense, lavender, peppermint, rosemary, orange, tea tree, lemon, lime, clove, spearmint, lemongrass, cinnamon, eucalyptus, and grapefruit. 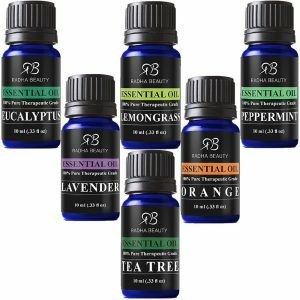 This is a really nice sized starter kit that gives you 10 ml bottles of six different essential oils: lavender, tea tree, eucalyptus, peppermint, lemongrass, and sweet orange. They get consistently good reviews for their products and promise that their oils contain no additives or fillers. 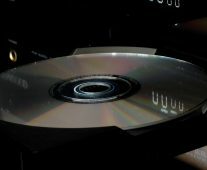 One way you know these are good is that they offer a 100 day no hassle, 100% money back guarantee and claim that you don’t even have to return the product for your refund. That shows that they have a lot of confidence in the performance of their product, which means you’re getting a high quality set. 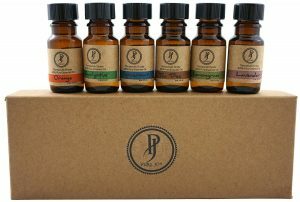 Radha Beauty’s Aromatherapy Kit comes with six different scents of their most popular oils. You get 10 ml of each. 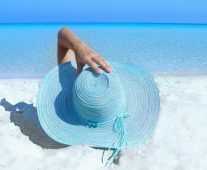 Their products are 100% pure and steamed distilled with no additives, fillers, or carriers added. This is another company that stands by the high quality of their products, offering a 100% money back guarantee if you don’t love their products. They’ll even let you keep the kit and give you a full refund if you’re not satisfied. They get consistently high praise from their customers, so it’s a safe bet that they’re a good company to trust. This kit includes lavender, tea tree, eucalyptus, peppermint, lemongrass, and sweet orange essential oils. 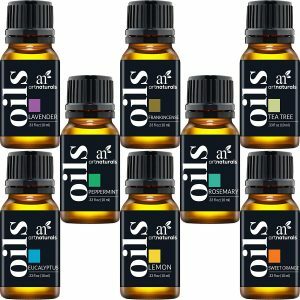 This set from ArtNaturals offers eight 10 ml bottles of some of their favorite and most popular scents. You’ll get frankincense, lavender, eucalyptus, lemongrass, peppermint, sweet orange, tea tree, and rosemary. ArtNaturals uses the finest ingredients from around the world, sourcing from Morocco to Australia. 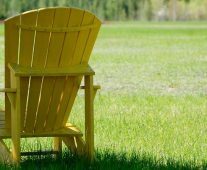 They strive to bring you affordable, environmentally friendly products that help their customers live a healthy life. They get great feedback from their customers but don’t offer any money back guarantees. Fabulous Frannie has a passion for providing high quality, ethically sourced products to their customer and their essential oils are no exception. This set will provide you with fourteen different 10 ml bottles of the brand’s most popular oils: eucalyptus, grapefruit, lavender, lemon, lemongrass, lime, patchouli, peppermint, pine, rosemary, spearmint, sweet orange, tangerine and tea tree. These are 100% pure oils with no fillers or carriers added. They come wrapped in a gift box, ready to give as a gift or just to spoil yourself. If you’re looking for something with a few bottles to try, the doTERRA introductory kit gives you three 5 ml bottles of essential oils to start your journey – lavender, lemon, and peppermint. These are three of the brand’s most popular and will give you a full experience so you can see what essential oils are really all about. DoTerra started with a commitment to bring essential oils into the lives of people around the world of only the highest, purest quality. If you’re thinking about using essential oils, we’ve covered a few of the best starter kits out there. Whether you only want a few scents so you can try it out or you want to try as many as you can, by reading through our reviews, you’ll be able to find the right start kit for you. Not sure how to use your essential oils? A nebulizer is the best way to deliver essential oils for aromatherapy. Aromatherapy also goes quite well with baths. If that interests you, pamper yourself with some luxury bath products, and maybe think about upgrading your bathroom with a luxurious soaking tub.